Selection and Use of Engineering Materials provides an understanding of the basic principles of materials selection as practised in engineering manufacture and design with an overview of established materials usage. Emphasis is placed on identifying service requirements and how materials relate to those requirements, rather than listing materials and describing applications. This edition has been revised throughout and now includes coverage of the use of new materials in engineering, materials for bearings and tribological usage, and the use of materials in civil engineering structures. It has also been expanded to include more case studies and worked examples in order to provide tangible and interactive contact with the content matter. The book also contains a detailed consideration of the weldability of steels, the welding of plastics and adhesion. programmes. An example of this development is the inclusion of a chapter detailing the use of materials in automobile structures; a field in which the traditional use of steel is being displaced as the application of reinforced polymers becomes more widespread. The book also reflects the growing use of computerized databases and materials selection programmes. 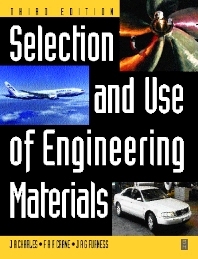 INCLUDE: Preface; Introduction; Motivation for selection; Cost basis for selection; Establishment of service requirements and failure analysis; Specifications and quality control; Static strength; Toughness; Stiffness; Fatigue; Creep and temperature resistance; Selection for corrosion resistance; Selection of materials for resistance to wear; The relationship between materials selection and materials processing; The formalization of selection procedures; Materials for airframes; Materials for engines and power generation; Materials for automobile structures; Materials for bearings; Investigative case studies; Index.